A massive but gently-sloped volcano on the north side of the Iskut River, between the Hoodoo Glacier and the Twin Glacier. 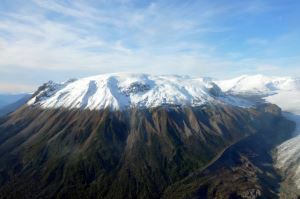 Most of the volcano was formed by lava bubbling up underneath beneath glacial ice. It's considered active and could erupt in the future.